Meet Sony Xperia Z5 Premium, the first smartphone that packs 4K display! Would you get this phone? Here are the reasons. Sony Xperia Z5 Premium and the rest of the Xperia Z5 family are definitely the stars of this year’s IFA 2015. The smartphones, especially the Xperia Z5 premium, come with a lot of big guns which threaten existing flagships this year. The handset's 4K display has been marketed as its marquee feature, but the Xperia Z5 Premium has a bucket-full of aces inside its glossy finish. Join us as we dish out five reasons why you need to consider the phone to be your next daily driver. So let’s start with the obvious, Sony Xperia Z5 Premium is the first ever handset to have a 4K display resolution. It means that its display has almost four times clarity than 1080p full HD variants. To be specific, the 5.5-inch IPS Triluminos panel is at 3840 x 2160 pixel resolution which frames an extravagant 806 ppi density. The company insists that you’ll have the best display in the market in the palm of your hands. This marks the first camera update of the flagship Xperia handset since the release of Xperia Z1 way back in 2013. According to the company, it comes with 23MP Sony Exmor RS sensor sized at 1/2.3” but it could reach up to 25MP if prompted to take 16:9-resolution photo and video. The Sony G Lens features a f/2.0 aperture and has the fastest AutoFocus in the planet at 0.03 seconds. In terms of camera software, Sony also includes some necessities like the SteadyShot, Superior Auto Mode and Intelligent Active Mode function. We all know that battery life is the Xperia Z’s edge over other smartphone contenders. But the nifty feature was left in the cutting room when the Xperia Z3+ was released. Now, Sony slaps a 3430 mAh battery in the Xperia Z5 Premium which promises to have a two-day battery life. It is interesting to know though if the jump in the battery was intended only for the 4K display. As far as the design goes, the Sony Xperia Z5 Premium features a stainless steel frame with a mirror-like finish just like the Samsung Galaxy S6 series. There are three hues for you to choose from – Gold, Black and my personal favorite Chrome. 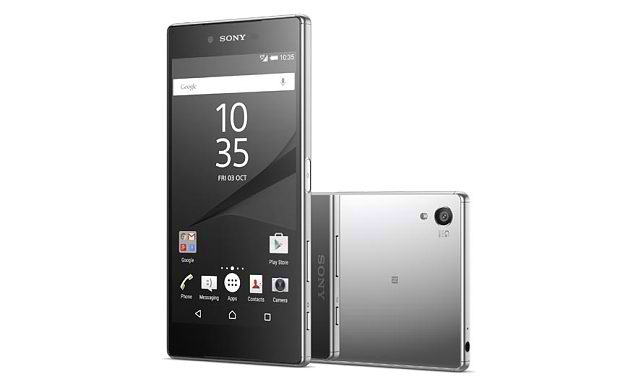 The Xperia Z5 still highlights the OmniBalance design of metal-and-glass which is sealed with IP65/IP68 rating. This means that the handset is tolerant to dust and is completely water-resistant in at most 1.5 meters of water submersion in 30 minutes. It is also worth noting that the USB port of the Z5 Premium is capless unlike other offerings in the market. The Sony Xperia Z5 Premium packs a dedicated fingerprint sensor tucked in the side of the device. The scanner can accurately recognize partial fingerprints. And since it is embedded in the power button, you can wake and unlock the device at the same time. Other specifics of the device include the Snapdragon 810 chipset which is coupled with 3GB of RAM, 32GB native storage with up to 200GB expansion, Cat. 6 LTE and Android 5.1 Lollipop.